Hidden Figures could have easily been one of those films that plays things right down the middle. Mainstream to the max. A standard structure with a likeable cast delivering an uplifting and equally heartwarming story that inspires us all to live our lives in something of a better fashion and to many ends-it is exactly that. That may sound as if I'm coming out the gate reducing the film to cliché via expectation, but it is how Hidden Figures both uses such identifiers to its advantage without reducing itself to those overused thoughts that make it charming while still routine. Exciting while ultimately a little obvious. It is a film with just the right amount of sass and just the right amount of authenticity to meet somewhere in the middle between a made for TV movie and that of a larger budget biopic, but this time with three central characters rather than just one formerly famous person. What Hidden Figures does so deftly is suggest how well-known its three protagonists should be rather than playing off how well known they clearly aren't. That their accomplishments are far greater than anything any musician or actor might be able to contribute to society, but due to the fact their profession is much less attractive (and their circumstances even less so) than performing on stage they seem fated to go down in history with little to no recognition. As these things tend to go though, Hollywood can't ignore a good underdog story, but when this is true in terms of something as large as the legacy of both the three individuals whose lives this film chronicles as well as all the women and women of color that these three stand to represent, such Hollywood reliabilities aren't always such a bad thing. From the director of the safe, but pleasing St. Vincent comes another competently made piece of cinema that exercises its big heart and sentimental streak in ways that are familiar, but that are executed so well and with such strong characters that it's impossible not to find yourself drawn to the satisfying journey Hidden Figures takes us on. Juggling three individual arcs with multiple facets within each and a scope that deals in the space race of the 1960's Hidden Figures is certainly a much more ambitious project than that of director Theodore Melfi's previous film, but one that he handles with assured grace as in only his second feature Melfi has proven he has the rare talent of crafting movies that are unabashedly feel-good while not allowing the saccharine aspects to overstep their boundaries forcing the story and the characters that craft that story to be as authentic as the beats are familiar. 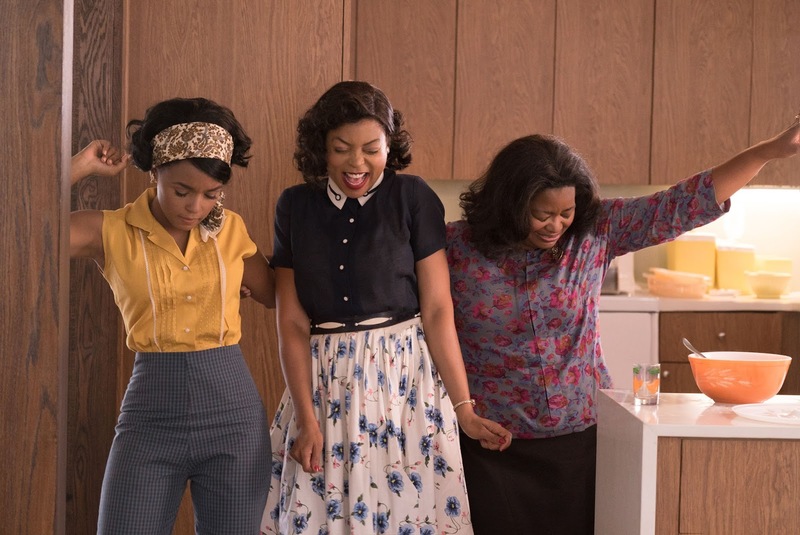 From left: Mary Jackson (Janelle Monáe), Katherine Johnson (Taraji P. Henson), and Dorothy Vaughn (Octavia Spencer) find strength in one another in Hidden Figures. Photo Credit: Hopper Stone/Hopper Stone, SMPSP - © TM & © 2016 Twentieth Century Fox Film Corporation. In many ways, Hidden Figures opens as expected showing us the early beginnings of one Katherine Johnson in West Virginia in 1926. We are more or less told outright that Katherine is a mathematical savant of sorts and that her parents are encouraged to do whatever it takes to get her the best opportunities they can grant her at this time considering she is a black female. Fast forward to 1961 where Katherine has grown up to look like Taraji P. Henson and we get the answer to the question of "seeing what she became." We are now in Hampton, Virginia as Katherine sits in a car with her books, her friend Dorothy Vaughn (Octavia Spencer) works on their broken car and Mary Jackson (Janelle Monáe) leans against the back touching up her make-up. These three women, as we are first introduced to each of their rather distinct personalities, form the basis of the film and its driving force despite the whole of the narrative centering on a task beyond anything ever accomplished before by the human race. 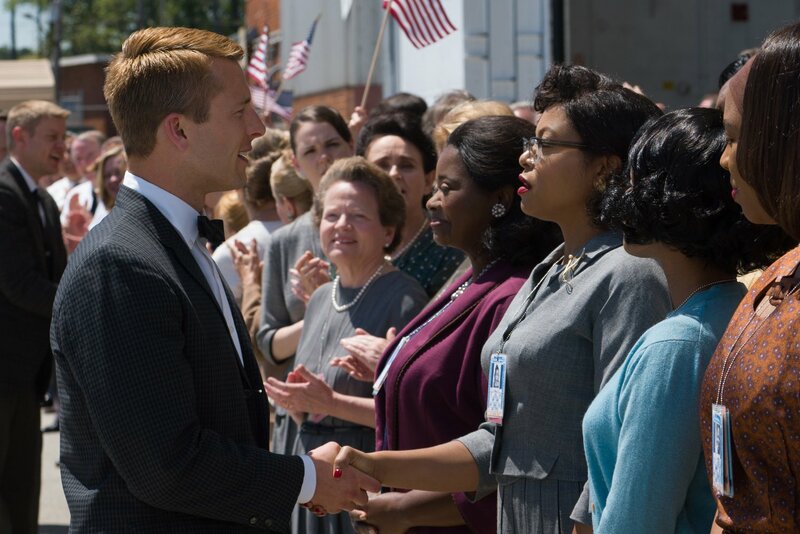 Hidden Figures is very much about the United States racing against Russia to put a man in space and the seemingly insurmountable odds that had to be overcome in order to do such, but obviously the hook here is how NASA found talent in places that most wouldn't have thought to look given the context of the time. Building toward the orbit around the earth taken by John Glenn (played here by Glen Powell) the film integrates the roles both played and afforded the likes of Katherine, Mary, and Dorothy and how each of their contributions not only allowed the program to feel safe in moving forward with the launch, but in aiding in the decision of whether or not they would be given the "go" at all. Katherine becomes a human computer for the Space Task Group headed by Al Harrison (Kevin Costner); essentially a group of engineers tasked with managing America's manned spaceflight programs. Each of the three protagonists here worked in the segregated West Area Computers division of the Langley Research Center, but Dorothy had more or less become the supervisor and was looking for a promotion whereas Jackson would become what NASA would call the only black female aeronautical engineer in the field during the 1950's. There is clearly a lot going on in Hidden Figures and much to balance, but it never feels as if the movie is having to juggle numerous plotlines or characters when in the midst of actually experiencing it. Rather, Melfi is able to create this atmosphere of ease despite the challenges the characters face and despite the inherent tension that is born out of the time period and the color of our group of protagonists' skin. 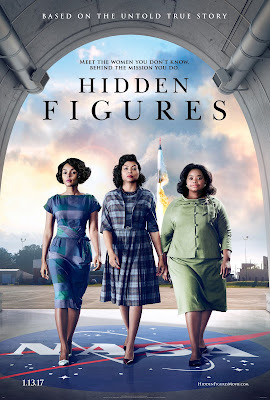 Meaning, Hidden Figures is a film that one can sink down with and never feel the urge or need to get overly involved with as it more or less spells out the lessons it cares to discuss, maintains a solid entertainment factor, and satisfies on all levels we expect from the cinema. Of course, this lack of a feeling to sit up and want to participate when your film is chronicling something as socially relevant today as discrimination in reference to gender and racial profiling is undoubtedly what gives the film a more conventional artistry rather than the more ambitious type you'll see from superior films. That isn't to say Hidden Figures falls short as it does what it wants to do in fine form and there is plenty of things to compliment. The few shortcomings may ultimately lend the film a less "important" vibe than it deserves, but by virtue of the fact of whose story it's telling it automatically garners a portion of that "importance" factor and rightfully so. All of this is to say that Melfi handles himself well and conveys this inherently moving story with a broad appeal that won't exclude certain audiences because of its particular artistic ambitions, but rather and as stated before, Hidden Figures plays things right down the middle in "after school special" fashion while using its many contributing factors to allow it to be several levels more credible. Weaving its tale from Johnson and her dealings with her new office mates that are all white and mostly male in with the small, but critical details that make her day to day all the more strenuous on top of having to figure out calculations that the launch of Glenn depends to her personal life where she has been widowed and left to raise her daughters alone despite being courted by Jim Johnson (Mahershala Ali) and onto the butting of heads between Vaughn and her supervisor (Kirsten Dunst) as well as Monáe's quest to get approved to take classes at an all-white college so that she might garner that title of engineer are each communicated in a smooth fashion allowing the product as a whole to feel largely just as flawless. John Glenn (Glen Powell) introduces himself to the unseen women who helped his orbit around the earth become a reality. The most major of those contributing factors that allows for the film to feel like more than just a step by step tour through an acknowledgment of the actions of these women are the performances from our three leads. As Johnson, Henson takes on the role of the main character in which writer Allison Schroeder (Mean Girls 2) gives the most time to which makes sense given she is the most direct link to the cause and effect of why the launching of the first man into space may or may not happen, but in a funny twist of fate is also the most reserved of the three main characters. This only makes watching Henson as Johnson come out of her shell as she finds her footing in her new environment and the confidence to stand up to her superiors all the more satisfying given we know from the short prologue featuring Johnson as a child that she is likely smarter than anyone else in the room. Costner, it should be noted, is also superbly effective as a man who could care less about who's getting him the answers just as long as someone is getting him what he needs in order to make his assignment happen. A running bit with Johnson having to sprint nearly a mile across the NASA campus to use the only "colored" bathroom culminates with a strong if not overly dramatic piece from Costner that he plays so perfectly it allows the viewer to gloss over the fact this was likely only added for said dramatic effect. Both the subtle and sometimes not so subtle prejudice Johnson has to face among her new co-workers is personified mostly in lead engineer Paul Stafford (Jim Parsons) who it's easy to see views Johnson as a threat, but thankfully never devolves into the stereotype we all expect him to that might have derailed the movie down a path it never needed to travel. Rather, the narrative stays honed in on Johnson and the flowering of her abilities within this setting that would prefer nothing other than to see her fail and Henson encapsulates these small wins both through her small gestures and meaningful expressions. And though Monáe's Jackson and Spencer's Vaughn could have certainly warranted movies of their own it is easy to see why their bigger personalities were left to radiate the portions in between and in support of Johnson's tale. Monáe is a scene-stealer and can deliver a rousing speech like nobody's business whereas Spencer proves as compelling as usual bringing all the heart and soul one could hope for to a movie that without it might have simply played as informational rather than with the touches of poignancy it consistently provides.